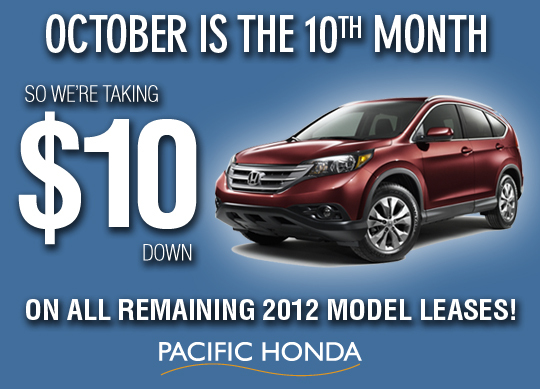 Pacific Honda Blog: $10 DOWN On All Remaining 2012 Model Leases! $10 DOWN On All Remaining 2012 Model Leases! To celebrate October (the 10th month), we are taking $10 Down on ALL remaining 2012 model leases! That's right, just $10! Check out all of our great lease specials and come to Pacific Honda today to take advantage of this amazing deal. Lease the 2013 Accord EX-L! Lease A 2013 Honda Fit Sport! Lease a 2013 Accord LX Sedan! 2013 Accord Coupe Goes On Sale TODAY! The Certifiably HUGE Sales Event! It's Fall! Check Out Our Specials!